The battle between good and evil continues in the Star Wars Choose Your Side Sticker Collection Book! Fun minifigure facts paired with action-packed images provide fascinating information about your favorite LEGO Star Wars minifigures, ships, vehicles, and battles. 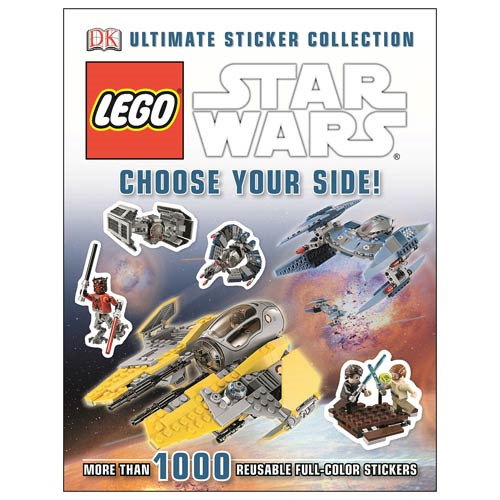 With more than 1,000 reusable stickers, fans of all ages can engage in battles between Jedi and Sith, humans and clones, or Ewoks and stormtroopers while discovering unique information about the 2014 LEGO Star Wars sets! Spans 96 pages. Measures approximately 11-inches tall x 8 1/2-inches wide. Ages 8 and up.